This week is my first time playing in The Greeting Farm's Farm Fresh Friday challenge. Every Friday they put up a challenge and everyone is invited to play along. I don't know why I've never done it before. But there are a MILLION challenges out there so it's hard to get to them all. This stamp is from the Signature Set. Did you know that my little sister's name is Dorothy? That's why I always love Wizard of Oz stuff. Anyhow, I colored this with my Copics and rounded a couple of the corners. The DP is DCWV. And then I added some dew drops. Hope you are all having a great day! This is so cute!! Fun! Adorable! Love your coloring! You're becoming a Copic master!!! This is just one cute card. 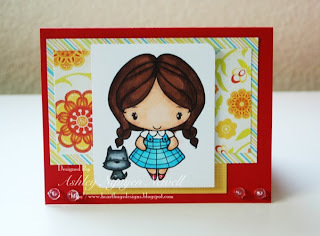 Oh isn’t she sweet - - I love the Wizard of Oz too…only my sister’s name is not Dorothy…um…don’t even have a sister – LOL But this is so fun; love all the bright Crayola kinda colors.